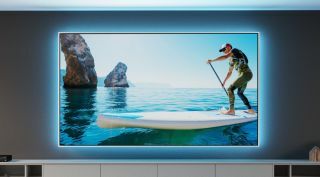 The What: Screen Innovations (SI), has launched an update to its Zero Edge screen line, the Zero Edge Pro, which provides customers with more customization options. The What Else: The Zero Edge Pro is available in 36 size total options, and three bezel options: small (0.5 inches), medium (1.5 inches), or large (2 inches). The medium and large options are available in 12 designer-selected colors with an inlay of hand-wrapped velvet or completely wrapped in velvet, made to order. Available colors are the same that were recently introduced on SI’s Solo Pro lithium-powered motorized screen. “Fixed frame screens have always been just a means to an end,” said Ryan Gustafson, CEO of Screen Innovations. “No one ever asked the customer what they wanted—which is always our first step in product development. And we did exactly that in designing the new Zero Edge Pro as a brand-new type of screen, giving customers the power to choose exactly how they want their screen to look. Zero Edge Pro is also available with SI’s LED backlighting options, another original feature on Zero Edge screens. SI has added a new option for backlighting as well, including a new IP controlled solution that can be integrated and controlled with Philips Hue Smart Lighting ecosystems. The Bottom Line: In conjunction with the release of Zero Edge Pro, SI has developed the largest-ever version of its Black Diamond ambient light-rejecting (ALR) material, XL, which is now available exclusively on Zero Edge Pro. Zero Edge Pro is also available in a variety of SI’s materials, including a new 1.0 gain material, named Unity, as well as a variety of acoustically transparent materials, such as Pure and Slate AT. SI is now taking orders for Zero Edge Pro, as well as its new line of ALR XL materials in custom sizes with a maximum height of 189 inches.